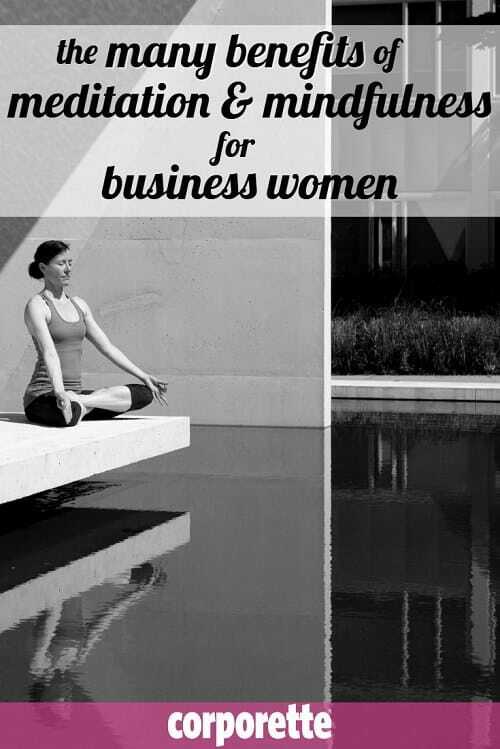 2018 Update: We still think this is a great discussion about the benefits of meditation for business women, but you may also want to check out our recent discussions of the best meditation apps for working women, as well as how to deal with overwhelm. Ladies, do you meditate? I’ve never found the time to learn to meditate myself, always considering it a luxury — but I just got back from an alumni networking event that featured a lot of mini-talks about the benefits of meditation for business women, lawyers, and other executives, and now I’m kind of fascinated. Did you realize that when done right, you’re literally changing the physical structure of your brain (a concept called neuroplasticity)? More focus, less brain fog. Appreciating the moment is a struggle for me, even when I’m around my kids — I always feel like I have to be taking pictures or writing down their silly quotes and so forth — and studies show that meditation can help your brain be more still and learn to appreciate the moment. One of the speakers (an engineering professor!) talked about the “flashlight effect” with your attention — the ability to shine your flashlight on what you want to is a learned skill. It doesn’t have to be super difficult. I had always worried that meditation required, like, weeks of dedicated study followed by a daily, hour-long “mindfulness practice.” When I would try to meditate and become overwhelmed by all of the thoughts scampering around in my little head, I worried I was “doing it wrong.” But one of the videos we saw was from the Headspace app, which noted that that’s actually normal — the object isn’t a clear mind, per se, but to detach from the busyness of your mind. (The 2-minute video shows a little cowboy sitting in the middle of traffic. watching his thoughts go by.) Another speaker was a psychologist who led us through guided meditations — and they got easier the more we did! The 2-minute one was super difficult for a lot of the women in the room, but somehow the 10-minute one passed quickly. She noted that if we had a thought clamoring for our attention we could label it, then let it go (e.g., “stress,” “anxiety,” “sadness”), and kept bringing us back to our breathing. Some of the other things she encouraged for “mini-mindfulness exercises” were things like “notice 5 things about this room that you haven’t noticed before.” (So yes, in theory, you might even be able to meditate on your rush hour in that you could be more mindful while stuck in traffic or riding the subway.) Headspace starts guided sessions at just 3 minutes! Ladies, do you meditate or otherwise try to be mindful? Where (and when) did you start? Do you have any favorite guided meditations, either on YouTube or in podcasts, or apps such as Headspace? What benefits have YOU gotten from meditation or a mindfulness practice? NY and Co is trying this, too (maybe it’s more of a stitch fix concept…but still)…I’m curious how this will work, if at all, for these mall stores. Has anybody tried to Ann Taylor? I shop there so much, I am kind of intrigued. I try meditation but often just fall asleep. I do find myself generally having a lot of meditative practices without specifically thinking of them as such. For instance, if my thoughts are racing and I can’t fall asleep, I’ll imagine myself going down a long hallway with painting along the walls and I’ll straighten each painting, etc. It’s a good way to unplug for me. I spent several months doing daily meditation (short, 5-10 minutes). This was recommended by my therapist several years ago as I was working through some difficult changes in my life. I also used it as a way to handle the hectic, crazy feeling of my busy life (working mom, super busy household, kids who do not listen/obey). It definitely becomes more comfortable as you work at it. I appreciate the benefits of it but have lapsed in my practice. I started meditating using Headspace about two months ago, and I am hooked. I meditate for 10 minutes as soon as I wake up in the morning. The first three weeks were not easy, and there are still days when I struggle with it, but overall I feel so much more capable of managing whatever rolls my way. It has also expanded my capacity for joy, and I find myself experiencing these flashes of pure happiness that I can’t remember having since I was a child. + 1 for Headspace. When I do it consistently, I feel generally calmer and more balanced, and it’s easier to keep from spiralling when super stressed. I struggle sometimes to do it though, even though I know it benefits me, and I discussed this with my therapist who told me that it’s natural for the body and mind to resist change, so it’s completely normal that I’m resistant and that I should push through and keep doing it even if my mind is telling me I don’t want to and what I really want is 10 minutes more sleep. Also, the important thing about meditation is the fact of it — you don’t have to be successful at clearing your mind and it’s okay if you’re having trouble visualizing (or whatever the technique is). We also discussed how I have trouble visualizing scenes or scenarios, but can easily imagine a “feeling”, so I’ve tweaked visualization exercises to conjuring the feelings they’re trying to evoke with the visualization and find those much more effective. I did the free trial on Headspace and enjoyed it, but perhaps it was my timing, I just didn’t get into it as a habit. I was using the app at the end of the work day. Every therapist I have ever had has recommended meditation. But it’s one of those things that I haven’t really been good about. I hear that many people either fall asleep or their minds race when they try to meditate. I’m of the latter category. I am curious if I would be better about doing it in a group setting, similar to yoga. I can’t seem to do it on my own, but I love going to yoga classes. Semi unrelated but I started using the Fabulous app recently and love it! (coming to IOS soon) It’s an award winning app created by Duke’s behavioral scientists that is heavily based on behavioral science/research on motivation, habit building etc. I sound like I am somehow affiliated with the app but I just really like how it has slowly caused a shift in my daily routine. I’ve done meditation seminars, mindfulness training, etc. YMMV, but personally I hate the way it’s touted as a cure all for all that ails you. If you like it, great, but not everyone’s mind works that way, any more than everyone must do yoga. Luckily I read somewhere that daydreaming also gives some of the same benefits, and I find it far more relaxing that trying to control my mind’s focus to the present. I try to control my focus all day long – sometimes it’s good to let my mind wander where it may! +1. I agree with all of this. I stuck with meditation for about a month and when I stopped … nothing was different? I think it’s fine as one wellness tools, but I didn’t find it to be this magical cure-all thing. I have a patient who is in recovery from heroin addiction by adopting a mindfulness practice in conjunction with taking Suboxone. She asked me once how I got “too many thoughts and memories to stop” and I told her about a yoga instructor I knew (by name/reputation, not personally) who also had a MS in family counseling. She went and told me about how the therapy sessions were held in the studio, on the floor, with a focus on breath and her mind/body response to whatever was coming up from the questions or ideas discussed in that session. Yoga poses were later added in with more frequency and complexity. She’s been going since 2014. I do enjoy yoga, but I can get critical of myself if I feel I’m “thinking too much” or “not relaxing / breathing enough” or can get caught up in wondering what I am going to make for dinner or if I’m even remotely in a pose correctly. I also find that if I have competing activities on the same day/time as yoga, it’s often the first activity to get cut. It’s unfortunate because I have never walked out of a yoga class regretting going. The “On Being” podcast had a recent (this week or last?) episode about how mindfulness doesn’t need to revolve around a particular idea or action like yoga, meditation, etc. Instead, mindfulness can be just about noticing and training oneself to be awake/present. It was intriguing because the approach was so practical and didn’t require a special time or setup. I use an app called Calm. It has a daily 10 minute meditation that I do at night before I go to bed. Its great for getting me to stop thinking about the day or whatever. They also have a TON of other meditations (7 days of meditation for sleep; 15 minute meditation body scan; 7 days of meditation on forgiveness) or whatever. I like it. I also use Calm and really love it. I usually do a 10 minute guided meditation every morning before I start my day and it really helps me stay calm and centered. They also have anti-stress meditations that I sometimes use mid day to calm down (used one once when I was about to have a meltdown over a crazy abusive client and it helped a great deal). They also have Sleep stories that are a soft mediation to listen to wand fall asleep. I use that when my mind is racing and I can’t get it to calm down so i can sleep. i really really like that app. I have to say that I find a regular mediation to be a real plus in my life. It helps me stay calm and better process all the normal ups, downs and stresses of life. I am hoping it helps me control my blood pressure which tends to skew borderline high. I too use Calm. 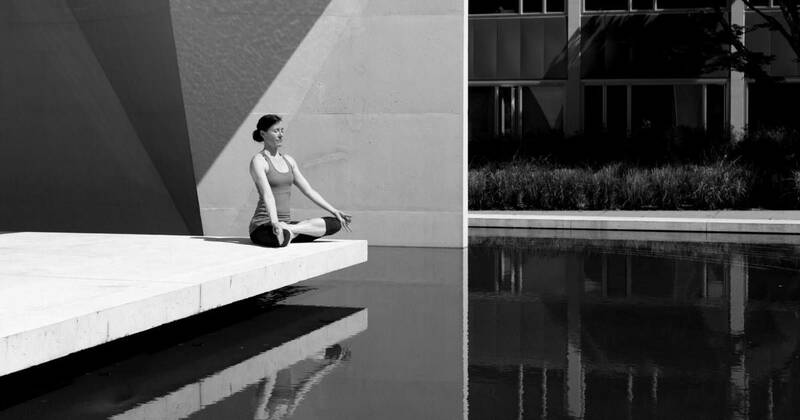 They have a an emergency calm meditation and I sometimes will do the 5 or 10 min session after a particularly painful meeting or major screw up at work. I use their deep sleep meditations to relax and every now and then the anxiety sessions. Quite a good investment for me. I found that yoga helps because once I am there, I am not leaving. But sometimes it takes 15 minutes of me being restless before I settle down and enjoy the feeling. I have also used the Calm app but I am so addicted to social media that I start on FB crap with my coffee. I really need to stop doing that! I also start the day on FB with my coffee and want to stop doing it. I think it would help me a lot to meditate instead. I have used the Headspace app off and on for a few months but haven’t gone enough days in a row to reap any benefits. I got fussed at in a spa for tending to work e-mails while soaking in a pedicure chair. You know what doesn’t bliss me out? Being fussed at in a spa. FWIW, I often go trap myself somewhere (show up 3 hours early for a flight) b/c then nothing else is intruding and I can actually focus on what I need to focus on (which is not relaxing, it is keeping all my trains working on time; THEN I can relax and be happy). Full disclosure, I’m a yoga teacher. :) I meditate daily. Always to a guided meditation, usually on the Insight Timer app (similar to Headspace). Sometimes as little as 1 min, sometimes as long as 30 min. The key for me is knowing that having a busy mind is normal and that I’m not “failing” at meditation if my mind goes to a to do list in the middle. When I noticed I’ve floated off, I let go of the thoughts and bring myself back into the meditation. I really like breathing exercises as well for mindfullness, which almost always accompany meditation and yoga classes. Concentrating on the breathe gives the mind a job and helps give it a break from all the other things we think about constantly. Breathing is the only function that can be performed by the body both fully voluntarily and involuntarily. The voluntary process = actions and the involuntary process = reaction. When I practice controlling my breathing, I’m becoming more mindful about my reactions and actions. Meditation can seem so hard and serious in abstract. But really, if you find yourself anxious and you stop yourself and sit for a minute naming your inhales and your exhales, you’re meditating. You don’t have to sit in silence, you can use really vivid, descriptive guided meditations that take you on a journey. The point is to come back into your body and ground yourself – not to turn off. I mediate every day when I come into work for 10 minutes, then after lunch for 1/2 hour, then when I come home from work. Myrna does yoga and wanted to teach me Vikram Yoga, but then I heard that the guy was involved in $exueal activity with people who were studying it with him. FOOEY! PS: I love the mediation as long as I am abel to do it, Kat! YAY!!! I’ve noticed that many of my clients’ businesses are starting to increase meditation awareness and their benefits to the employees. I have meditated almost daily for two years. About six months in the benefits of my practice starting seeping into daily life without me having to think about meditation. Now I crave meditation… I even crave full day meditations which I try to do once every few months (would love to do more). Meditation is like working out, but for the brain. If you only work out at the gym once or twice a week, or give up after a couple of months, then you won’t notice much of a difference in your body.